More than 1000 passengers and 600 crew members can take off their parkas and enjoy the New York summer weather. Crystal Serenity arrived in New York this morning after its record-breaking 32-day trip through the Northwest Passage from Alaska's southern coast. 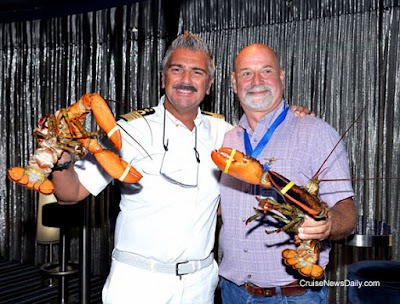 The complete story appeared in the September 16 edition of Cruise News Daily. 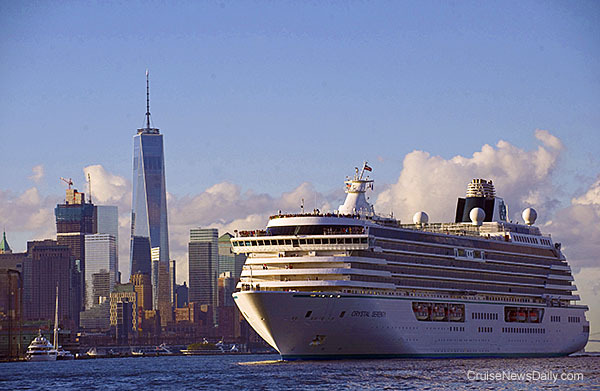 Crystal Serenity arriving New York this morning at the end or her 7,297-mile Northwest Passage voyage. Photo courtesy of Diana Bondareff and Crystal Cruises. All rights reserved. May not be copied or used without express permission. Details appeared in the September 16 edition of Cruise News Daily. Business is booming at Meyer Werft, and they are turning out ships in record time. To add to the Meyer yards' capacity, Meyer has contracted with a yard downriver on the river Ems in Emden, Nordseewerken, to build parts of their ships there. The complete story appeared in the September 15 edition of Cruise News Daily. Details appeared in the September 15 edition of Cruise News Daily. MSC said today they were going to delay opening their new private Bahamian island, Ocean Cay, until October 2018, basically because it's going to take longer to build than they thought. 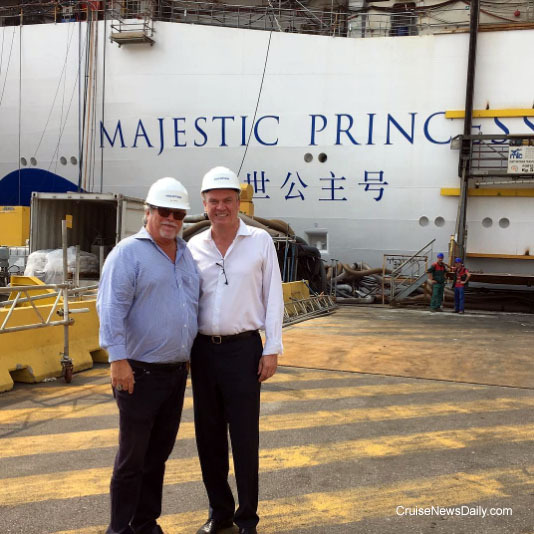 The complete story appeared in September 14 edition of Cruise News Daily. Meyer Werft is getting ready to send another ship out to sea. The German builder has scheduled Genting Dream to leave the Papenburg yard Sunday afternoon at 2pm, local time (8am Eastern time in the US). The departure from Meyer Werft will be webcast on the yard's website at www.meyewerft.de. As usual, the departure time can be adjusted due to weather, wind and tide conditions. Details appeared in the September 14 edition of Cruise News Daily. So you want to go to the beach, but you've cruised all over in the Caribbean. Next summer, Costa has put together two unusual itineraries that can take you to some of the best ports for beaches in the Mediterranean and in Greece on two of their most intimate ships. Details appeared in the September 13 edition of Cruise News Daily. One crew member aboard Harmony of the Seas died, and four others were injured today in an unusual accident during a crew lifeboat drill while the ship was docked in Marseille. Carnival Cruise Line has joined most other cruise lines and decided to drop calls at Kusadasi for balance of their European season on Carnival Vista. A 25-year-old woman from Columbia was reported going overboard from Norwegian Pearl Thursday morning about 5:30am while the ship was in Alaska in the Lynn Canal (an inlet that connects Skagway and Haines to Juneau), near Funter Bay, west of Juneau. A 67-year-old female passenger from China's Hunan Province went overboard from Sapphire Princess shortly after it left Shanghai Saturday evening. Two crew members were killed when Viking River Cruises' Viking Freya tried to go under a German bridge that was too low and it sliced off the ship's wheelhouse where they were.